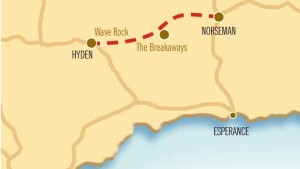 The Granite Woodlands & Discovery Trail links Hyden (Wave Rock) to Norseman, exploring pristine landscape with 16 interpretative sites along the way. Linking Hyden (Wave Rock) to Norseman, explore pristine landscape – home to one of the worlds greatest untouched temperate woodlands, with 16 interperative sites. 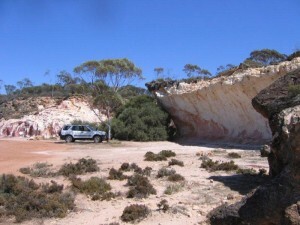 Spend time at Wave Rock then hit the dirt road east towards Norseman – much of the trail is gravel, but it is suitable for two-wheel drives and caravans. Road is subject to closure due to rain so check before departing. Sandy heathland gives way to nickel and gold mining land around Forrestania Plots. You know your are in the outback if you spot a bush turkey, dingo or some of the more elusive native animals like honey and pigmy possums, which are sometimes seen around Grevillea Hill. From here the landscape changes to mallee woodland and eucalyptus. Explore rocky outcrops and cliffs of The Breakaways where you will spend the night. You’ll see eucalyptus, sandy heathlands, hakea and flame grevillea as you set off east towards Mermaid Rock. Take in the vista at Lake Johnson and Lake Viewpoint. A spectacular open woodland of salmon gum trees awaits. Continue to Disappointment Rock and walk the 2 km trail around and over the outcrop. The next 40km stretch passes through an ever-changing landscape – from mallee woodland to mallee scrub, sandy shrub and strands of eucalyptus. Rolling rocky hills and abandoned mine shafts dot the landscape to Lake Cowan. The woodlands walk in Norseman completes the trail.